Bold Vision Bright Future Gift. Make your gift to the Bold Vision Bright Future Capital Campaign here. For an update on our Capital Campaign, click here. 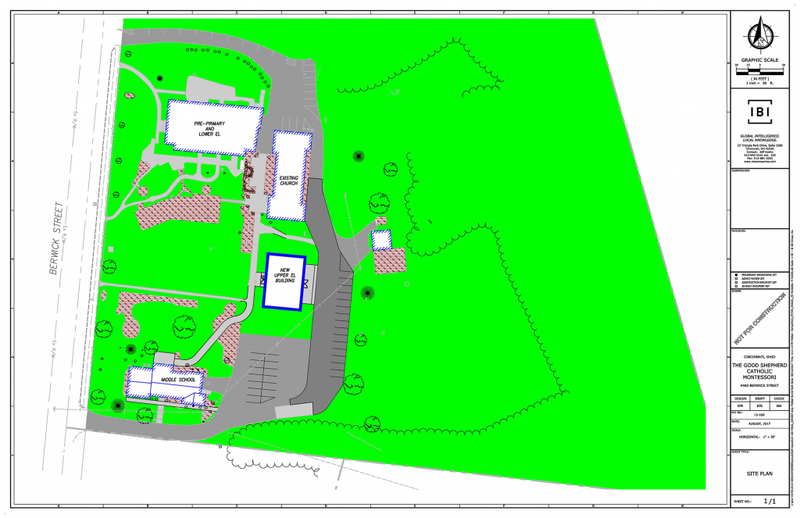 See below for an updated building plan. GSCM Launches Bold Vision. Bright Future Campaign. For the past 20 years, the community of GSCM has been blessed by incredible generosity and providence. Now as we continue to build upon the vision, we are embarking on one of our most exciting projects to date. The “Bold Vision Bright Future” campaign will raise funds to build a new building for expanded instructional space for the Upper Elementary and Middle School programs. The need is great for additional instructional space at GSCM. An attractive, new building will reflect the beauty of the Montessori work accomplished in the classrooms. Our goal is to raise $750,000 to construct a new 7,200-square-foot building to house the Upper Elementary and Middle School programs. The benefits listed below support the unique qualities of our program, setting GSCM apart from typical elementary and middle schools. Additionally, a permanent Middle School structure will incentivize students to remain at GSCM through the middle school years. Space for “Purposeful Hum” – Ample space for children to collaborate on projects in normal, quiet voices for that purposeful hum of a Montessori community. Project Work – Adequate room to work on sizable projects and perform group work. Tutoring Rooms – Provide one-on-one assistance from the teacher and perform private lessons. Library Nook – Allows for a quiet place to read and perform small group literature discussions. Art Connections – Enhanced curriculum opportunities for working with clay, paint and other messy materials. Practical Life – Ability for students to prepare food, a tenant of Montessori education. Community – Option of opening up classrooms to one another for community activities. Outdoor Classroom – Immediate access to the outdoor environment with adequate supervision. Science and Technology Instruction – Fully equipped science and technology classroom for a robust science inquiry program and ample space to support technology use. Practical Life – Meal preparation from harvest to table, bringing the current Erdkinder program full circle. Reflection and Opportunities for Quiet – Larger space for quiet reading and reflection, an integral component of the development of the whole person in Montessori education. We are excited to chair the “Bold Vision Bright Future” campaign and to share in this effort with each of you! Combined, our children span all ages and grade levels at The Good Shepherd Catholic Montessori, and collectively, we are experiencing the many opportunities GSCM has to offer. Each one of our children is unique and has benefitted from being at a Montessori school rooted in faith, and most importantly, growing “in wisdom before God and men” (Luke 2:52). Our three families continue to choose GSCM because our children are developing as whole, well-integrated persons. We’ve seen the individual transformation of each child and want to ensure this exceptional experience is available to others. Our children thrive because of our wonderful teachers, and the well-prepared Montessori classrooms in which they work are firmly rooted in the Catechesis of the Good Shepherd. The teachers at our school don’t just foster learning, but rather, a love of learning. We believe this campaign and the construction of additional classroom space will greatly enhance our uniquely Catholic Montessori programs and the potential of our school. And so it’s with a fundamental belief in our school’s mission that we invite each of you to understand the vision and the details of this campaign. Please pray for our children, for our school, and ask the Holy Spirit to guide us on our way. Jesus said, “The kingdom of heaven is like a mustard seed that a person took and sowed in a field” (Matthew 13:31). The beginning of our school in 1998 was really a “mustard seed” moment. Something very small was sown in very humble circumstances. Like the seed, GSCM grew and changed. We increased in size, changed locations and purchased and improved our property. During this time, something deeper and more important was taking place: The lives of the children we served were “growing in wisdom and stature before God and men” (Luke 2:52). Now we are poised to once again nurture this “GSCM mustard seed plant” in its continued growth and transformation so that – through our work and God’s grace – the lives of children and our mission in this little corner of the Kingdom can resound for the glory of God. If you’d like to see more about our wonderful school, please click on the link below. Want to know more or find out how you can be involved in this exciting opportunity for GSCM? Contact our Development Director, Jana Widmeyer, at jwidmeyer@gscmontessori.org or 513-760-8479. Make your gift to the Bold Vision Bright Future Capital Campaign here.